What began as a never-before-seen performance sock has become a phenomenon. In 2008, basketball players spent little time discussing the performance value of socks. Buying socks in bulk for value was the norm. Nike Basketball saw an opportunity to revolutionize the market with a technically advanced sock that delivered high performance and an iconic look. 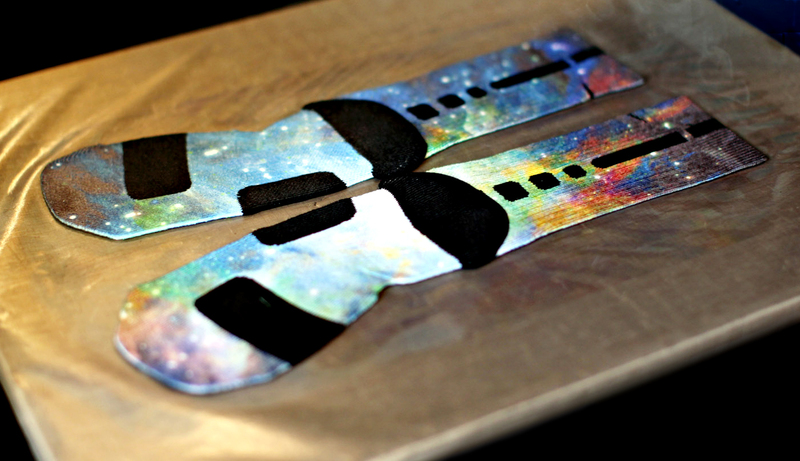 Since its inception in 2008, the Nike Elite Basketball Crew sock has turned the industry upside down. Nike Elite Basketball Crew socks have been a resounding success. They also tell a deeper story about Nike’s strong commitment to the athlete through performance innovation. The initial model of the Nike Basketball Elite sock came to life in 2007 and was given to the USA Men’s Basketball Team during a tournament in Las Vegas. For the first time, Nike Basketball introduced socks with a specific right and left foot, which helped improve the fit. Enhanced cushioning provided comfort and support in specifically designated zones of the feet and ankle. Player feedback was positive, to say the least. In fact, the socks were so well received that retail demand was strong and immediate. The validation from the USA Men’s Basketball Team was the first step to inspiring a sock transformation in the sport. Since then Nike has provided socks to a variety of top teams from high schools to colleges and the feedback has helped evolve the Nike Elite Basketball Crew sock from good to outstanding. Through meticulous research and the use of innovative materials, fabrications and designs, the Nike Elite Basketball Crew sock features a sleek fit and strategically cushioned zones that provide comfort, support and cushioning protection specific to the game of basketball. 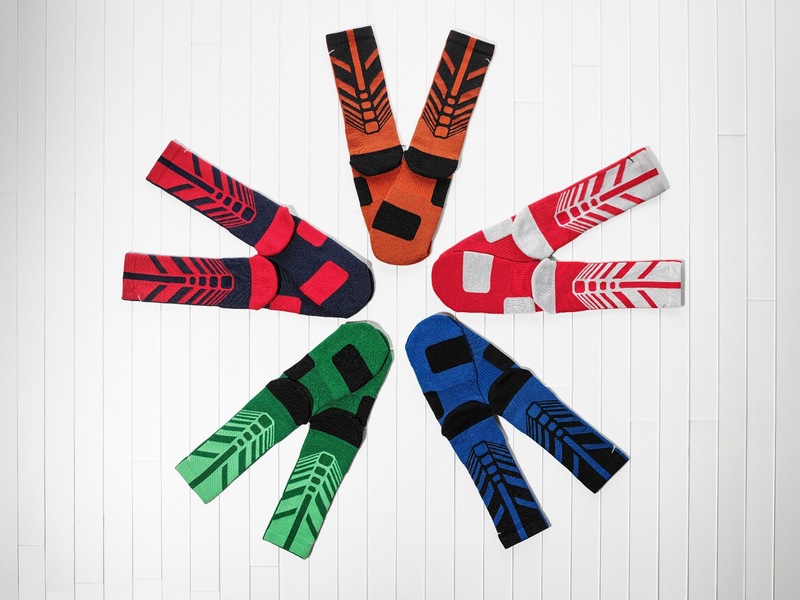 Nike Elite Basketball Crew socks offer anatomically correct right and left socks with an enhanced fit. The design process now mimics the intricacies of footwear design. Foot-strike cushioning aligns with pressure patterns for more comfort exactly where it is needed for basketball players. The cushioning around the ankle and Achilles helps protect feet from abrasions during play. Thin ribbing from below the ankle to the mid-foot provides a comfortable fit and great range of motion. And Dri-FIT fabric pulls sweat away to help keep feet dry and comfortable. Nike Elite Basketball Crew sock designers work closely with the Nike Basketball footwear design team to look at future innovations and incorporate shoe design elements into the current versions of the Nike Elite socks. “Merging athletes’ insight with the best in product innovation, functionality and style is where the magic happens,” Frazer says. "Then it’s up to the athlete to go out and show what they can do." 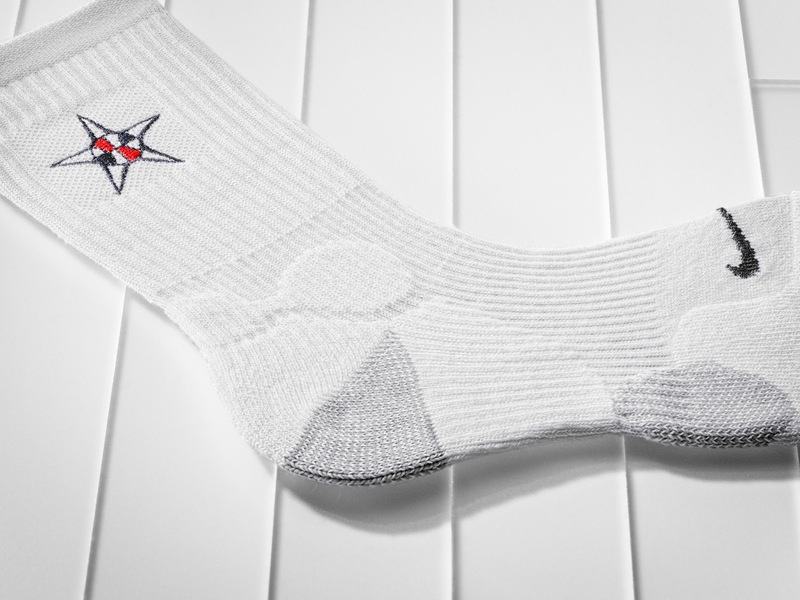 The Nike Basketball team started its visual identification on the Nike Basketball Elite Crew socks with a unique logo on the back of the sock, which became a universal identifier and design language for the socks that carries on to this day. On hardwood or concrete, the logo is a badge of honor of the court. The style has spread from the courts to the streets, and the socks have gained popularity overseas as youth everywhere fall in love with the socks' design and performance. 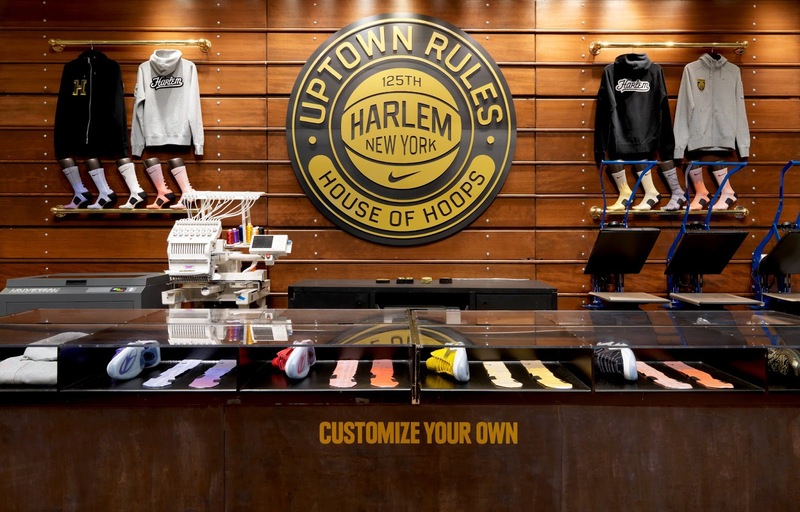 The sock designers also work closely with footwear and apparel design teams to develop various colors and graphic hook-ups that allow fans to have a consistent color look or to create their own personalized look. The timeline began in 2008. Widespread adoption in the NCAA followed. This was leveraged with the Nike Platinum Elite Basketball Crew sock, which was later launched in conjunction with college basketball team uniforms in Spring 2012. The Nike Elite 2 Layer Basketball Crew sock features a double-layer forefoot, while maintaining a streamlined design. 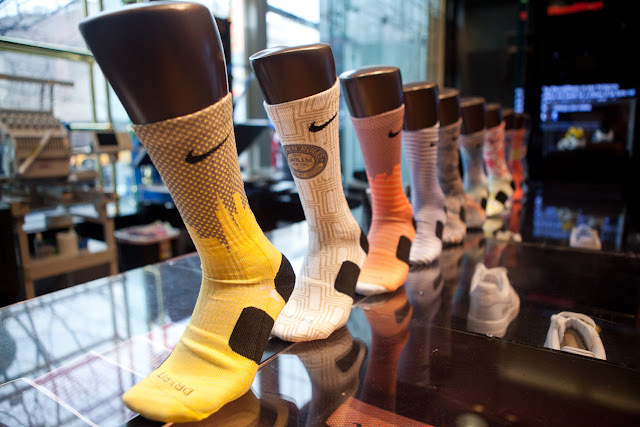 In July 2012, Nike debuted the Nike Elite 2.0 Basketball Crew sock, which was designed for Nike-sponsored national basketball teams across the world for the summer games use in London. 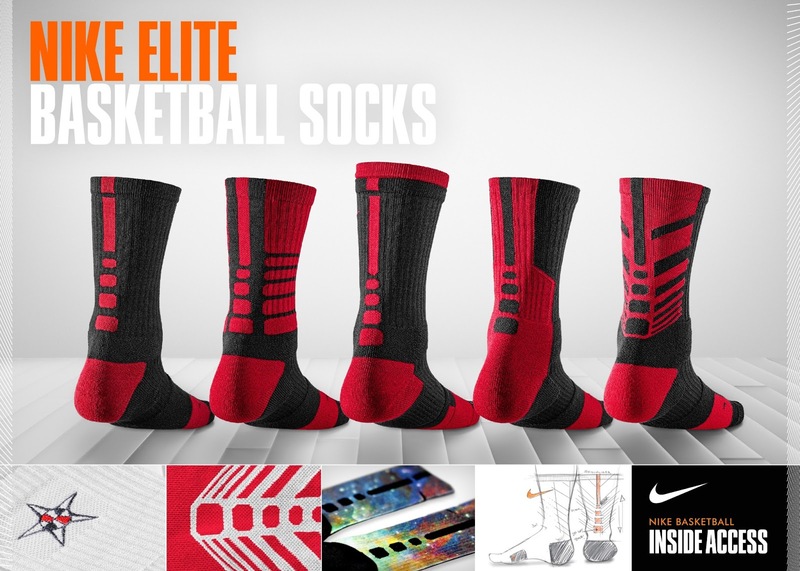 The most recent edition, the Nike Elite Sequalizer Basketball Crew sock, launched in January 2013, includes an expanded Elite graphic that carries through to apparel and will also be seen on Nike’s high-profile collegiate teams. During specific game moments, customized Nike Elite sock became so coveted that it turned the performance sock into the must-have item of the weekend. Five years in, the Nike Elite Basketball Crew sock trend is poised to continue the momentum with more colors and new technical innovations. But rest assured one thing won’t change - the iconic Nike Elite logo running up the back of the sock.